My cousin took this picture of me just a few days before I gave birth. When I was pregnant with my son, my daily yoga and seated meditation practice changed dramatically. 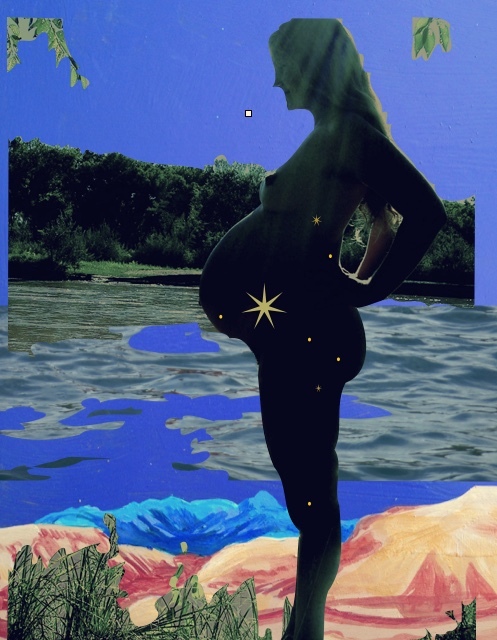 I allowed my practice to become increasingly informed by preparing my body and mind for birth, with sound and movement becoming important elements. I researched what was appropriate, in both books and media, as well as my own body. My birth experience was both ecstatic and deeply empowering, in part because of factors beyond my influence, but also because I had a firm foundation in how to consciously relax and create feeling safe, how to channel and move through intensity rather than resist it, how to observe sensation rather than react, and how to trust my body: it’s movements, positions, and ultimately, it’s animalistic wisdom. 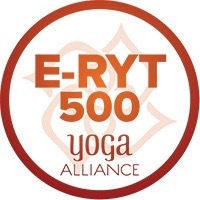 In over a decade of teaching and learning about prenatal yoga since, I have continued to deepen my appreciation of how yoga practice can nourish, stabilize, and calm pregnant moms, while at the same time familiarize the inner systems of the body-mind complex for birth, bonding, and postpartum radiance. Prenatal yoga also helps establish optimal birth position, (‘occiput anterior’ or head down, back forward) a key factor in avoiding interventions during birth. Pregnancy is a great time to deepen our relationship with the pelvic floor, our breath, our boundaries, and awaken dormant power. Truly, I see the journey of motherhood as a nobel path, one of spiritual growth. Here is a simple sequence for home practice. This is a sequence I put together for my friend Camella, an instructor at an advanced doula training, based on poses I often teach in my prenatal classes. It can be adapted as needed. (Email me if you are befuddled, at averyasana@gmail.com.) This type of practice is also great for fertility. Be sure you have enough padding under the knees. These poses offer various reliving and stabilizing qualities, and also translate well into labor poses. You can ad in your own favorite poses to the mix, as you desire. Good poses to add in include Upavishta Konasana (seated with the legs wide) and external rotation standing poses such as triangle and warrior 2. Avoid any yoga poses that compress or put pressure on the uterus, such as deep forward bends and deep abdominal twists, and especially avoid abdominal toning, as the can cause diastisis. Also avoid intense stretches, since your body has relaxin and it’s easy to create injury without realizing. I’ve written this up to share with my students, and for the use of the greater community of pregnant moms. If you wish to use my text or pictures in any other context I request in good faith that you please ask permission first. A little home practice in the morning, before plunging in to the responsibilities of the external world, or before bed, to assist healthy circulation and better sleep, can be really effective self care. Begin with breath. Keep returning to the breath. 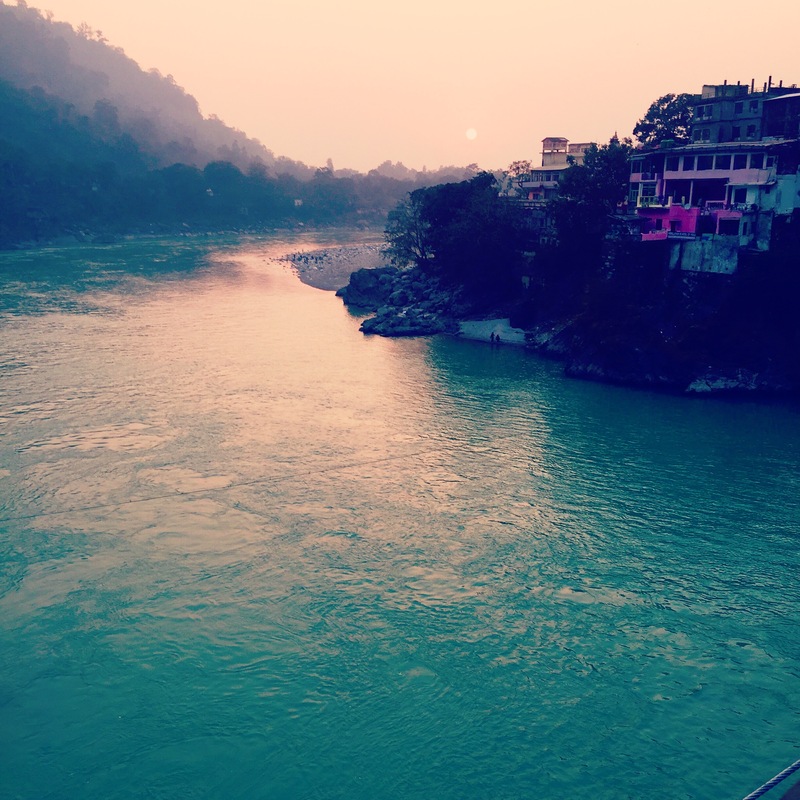 Keep exploring, what can I let go of, what can soften and relax, so that the breath can more easily move though me, and I can more effortlessly and completely receive the healing nourishment of the breath…? 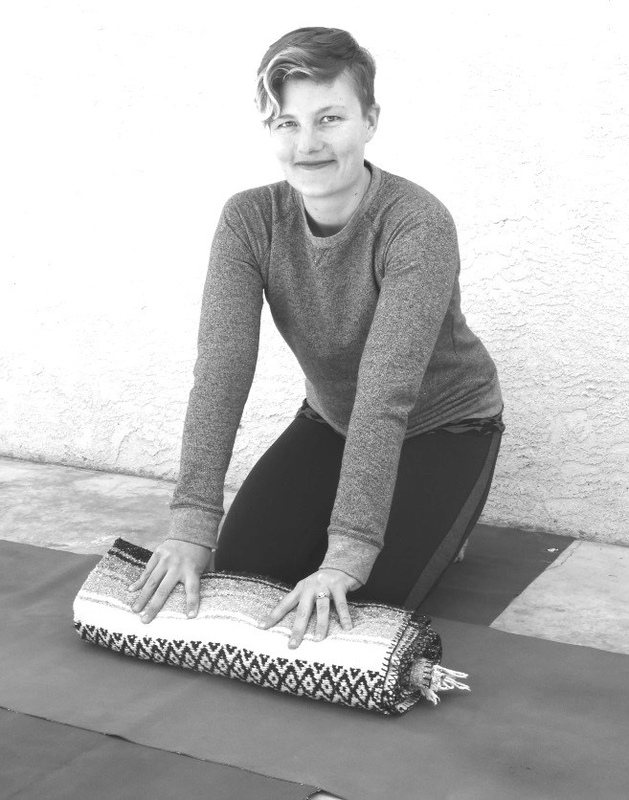 Rolling up a blanket for supporting the sacrum in badha konasana. The blanket should be firmly wedged between the wall and your upper sacrum/L5 area. You’ll need a bit of open wall space and a few blankets to practice this version. First, have a thin rolled blanket. 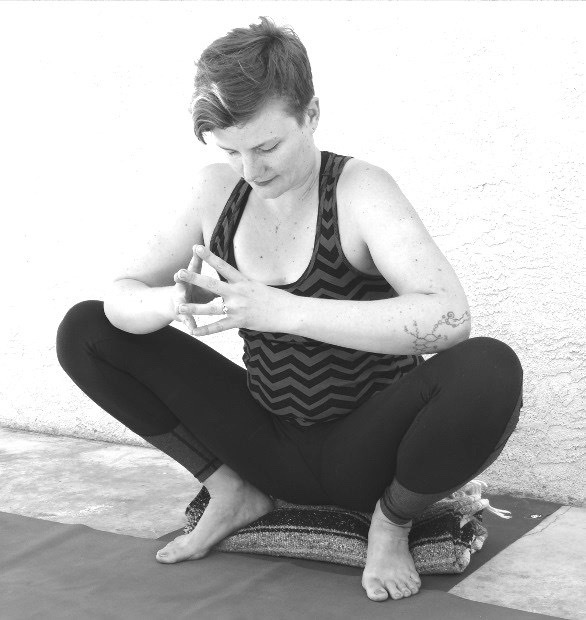 If your hips are tight (knees higher than pelvic rim when in the pose) take a second blanket under the sitting bones. An option to make the pose more passive: support under each leg with a blanket. If you need to release and stretch the pelvic floor, try this set up with rolled blankets under the knees. To increase lateral space in the pelvis and lengthen the inner thighs, add a block between the feet. Press your heels together, draw the sitting bones wide and back with your hands, as you reach the tailbone under the blanket, then press blanket down behind sacrum. If the blanket goes easily to the floor, start again, so the blankets is wedged quite firmly behind the sacrum (back of the pelvis/ base of the spine). This will give a healthy anterior tilt, with the sitting bones heavy at the front. 1. Sacrum is most stable when at an angle, it fits down into the pelvis, which closes/stabalizes the SI joints, which can be good for reliving SI joint pain and sciatica. 2. Pubic bone draw under, giving bony support for pelvic floor muscles and pelvic organs, so they can relax and avoid compression/ tension patterns. 3. Supports healthy space in intervertebral discs, relives low back strain. If the back is flat, there is compression in the spine. The back has the most length when it expresses it’s natural curves; the neutral lower lumber region should curve in, as though in a mild backbend. 4. Supports OBP by showing baby the space is in the front body, not the back. First, just relax: soften eyes, jaw, tongue…notice your breath, move from mind to body, external to internal. Practice coming very gently back to the breath, even though the mind will distract. Over and over, you come back to the breath, back inside to the present moment, just breathing through the sensations, whether they are mild or intense. Especially allow the throat to release. (Low long sound is very useful for relaxing the throat; try a long Ahhhhhhh sound.) The throat and birth canal area affect each other; if the throat and jaw are soft, you’ll soften down below, too. Take a moment to connect with your baby: feel how they are held safe inside, every cell in their strong healthy body glowing with vitality, their heartbeat steady. Feel the psychological, emotional connection between you and your baby, which is growing stronger day by day, and remains strong long after the physical chord is cut. Sense that you are your baby are working together, each doing your own special work to prepare for birth and beyond. Then, perhaps explore some pelvic floor awareness. Feel the inner pelvis, use imagination… watch for self criticism… come back to feeling, breathing. Sense the large round opening of the inner pelvis… feel the bony attachment point of the lower 2 levels of pelvic floor: sitting bones on sides, tailbone in back, pubic bone in front. They make a diamond… Inhaling, receive the natural downward expansion of the breath, pressure releasing down, blossoming, broadening. Then exhaling, on the natural cycle of inter abdominal pressure lifting, draw the 4 corners in, towards perinuem, lift… then relax, receive… several rounds with the breath. Soft tongue, soft eyes, soft breath. Hands and Knees is a great labor pose too, in fact one study showed it to be the #1 position for giving birth in a group of moms who were not told what position to birth in. The baby had lots of room, the inner pelvis can rest, the bones of the pelvis can all expand, unlike when you are laying in a bed. You can support yourself in labor by resting the head, arms, and chest forward on a soft sturdy support, such as a bed. When the hands are on the floor, be sure to keep the base of the tigers heavy, wrists light. This is also a wonderful pose for encouraging optimal birth position. ~Cat/ Cow: Notice how in flexion, as you open the back body and tuck the tail, the upper pelvis opens, and the bottom closes, then when you extend in the backbend, the bottom of the pelvis opens wide. These movements are great for helping the sacrum move so that baby’s head can pass through in labor. 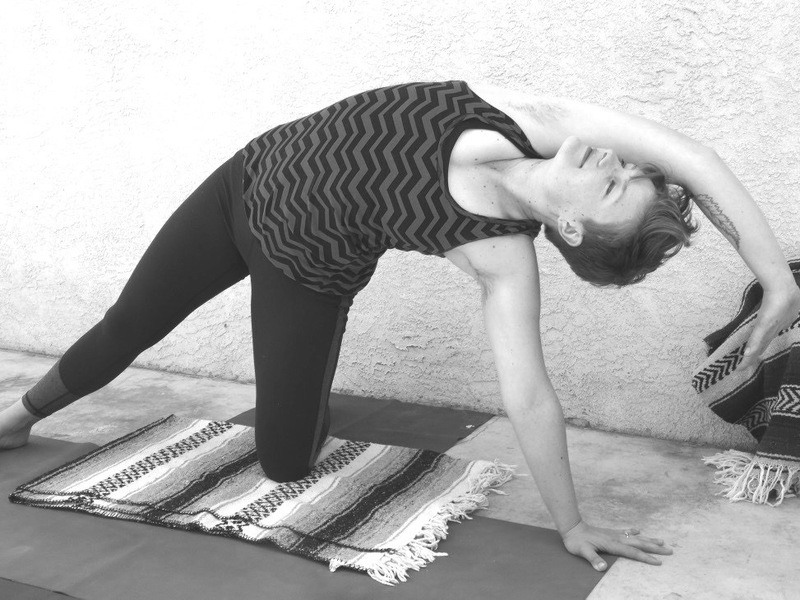 ~Twist: Explore this pose with an audible exhale into the twist, repeat 2-4 times each side. Remember, lengthening the exhale helps the nervous system/ mind to relax! Ahhhhh. This is a nice safe way to rotate the spine within compressing baby’s space. 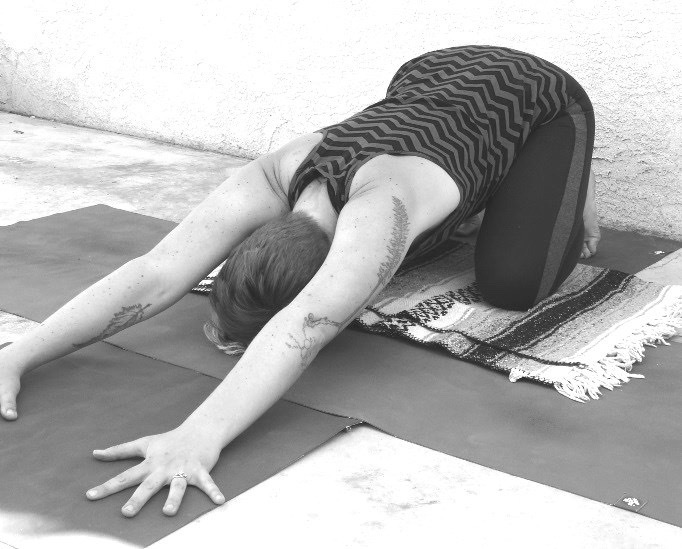 …then rotate, extending our through the core of the arms. 3. 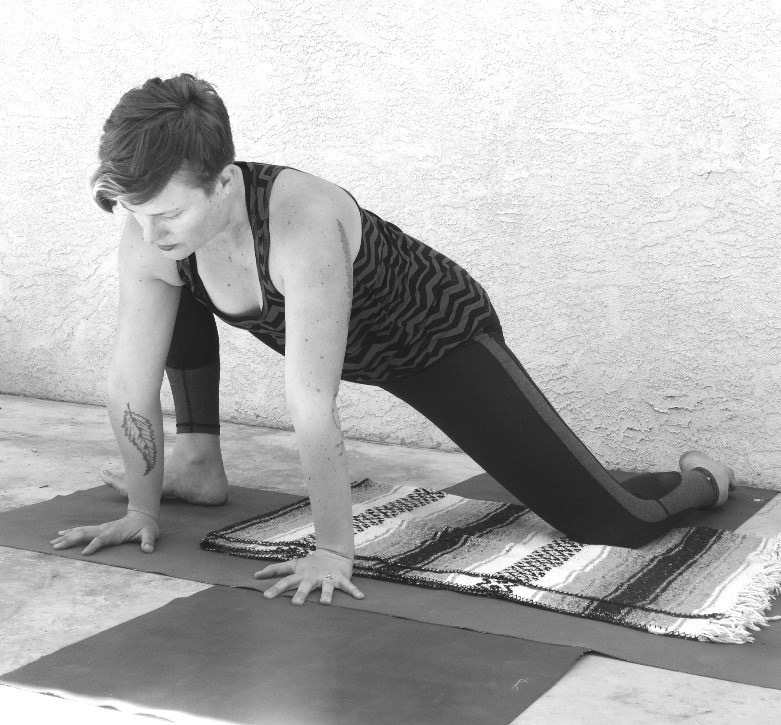 Side Lunge Series: This is a whole sequence of nourishing movements that link together…. This action opens the right side inner pelvis, and can be done on a birth ball, with the upper body and head resting on a bed, or high couch, for a more supported version in labor. Elbow to knee: stay in your lunge, reach left arm over at a diagonal, stretch. This help open lateral spine and increase ease of side body breath, making more room for the digestive organs and growing baby. c. Circle the extended arm, slow… reach fully through shoulder, through the fingers; increase circulation to mammary glands. e. Pelvic Floor Stretch: A gem from Leslie Howard! Bring your right heel outside wrist, and keep that inner heel heavy, as you circle the sitting bone out and around, as if you have a spoon attached to the sits bones and you are stirring a big bowl of cookie dough behind you. Or, in you favorite color, paint some huge bold circles on the floor, walk, and ceiling with you sitting bone paintbrush! This is a fabulous stretch for the transverse perineal muscles, the layer of the pelvic floor that connect the perineum to the sits bones. out to side to make room for that lovely belly. h. Lateral Release: Swing leg back to the right side, flex foot, walk hands out to left, wrist beyond shoulder, open right hip over left, right shoulder over, drape and extend arm… open side body. 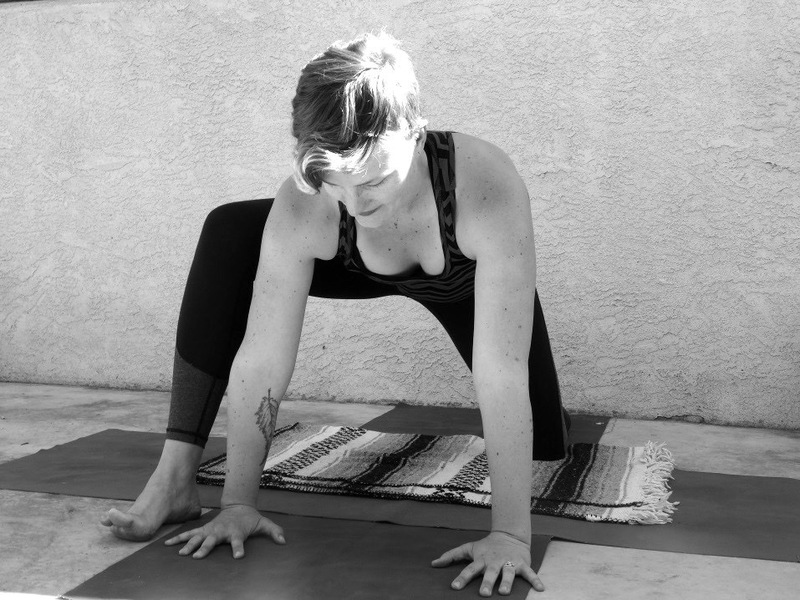 Back to HANDS AND KNEES, hip circle, observe if hips feel better, then take a down dog, or rest in child’s pose. Then REPEAT on the LEFT side>>>> yummy! 4. Adho Mukha Svanasana, Downward Facing Dog Pose, with bent knees, or Adho Mukha Virasana, Downward Facing Hero Pose. 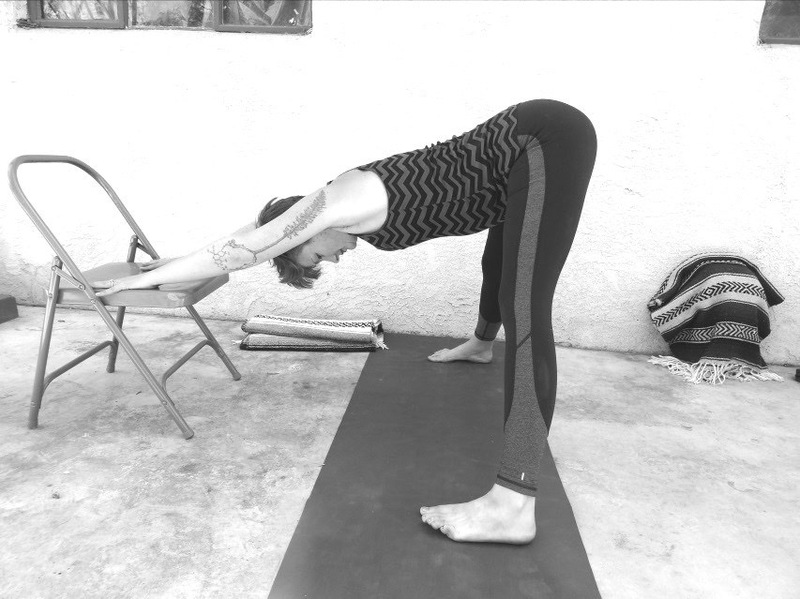 After the asymmetrical work in the luge series, it’s helpful to take several breaths in one of these poses, to lengthen the spine, integrate the work from the lunges, and come back to center. I usually opt for the knees bent downward dog version for pregnant moms, because if the backs of the legs are tight (and often they are!) the pelvis will tuck, the low back will flatten and compress, and the inner pelvis will get jammed. Focus on the lift and broadening of the sitting bones, and the length of the spine as you equally and deliberately extend the arms, and press down the ball mounds of the index fingers (the inner upper corner of the palm of each hand). If this pose is too taxing or you want to avoid it for any other reason, you can do the same good work with the knees down. 5. Squat— explore different variations: take height under heels if the lower legs are tight and/or the feet pronate (where the inner ankles collapse in). Try squatting while leaning against a wall, or resting the head and stacked hands on support in front of you, such as a padded chair, or a birth ball. Squatting is a great way to amplify the downward pressure and effectiveness of contractions during labor; you can squat with support, such as on a toilet seat, a small birth ball, or leaning forward resting the chest, arms, and head on a soft chair or bed. If you are 32 weeks or beyond, and baby is NOT in the optimal birth position (back forward, head down) better to spend time in hands and knees instead; squatting brings the baby down low into the pelvis, where it’s harder for them to turn around. 6. 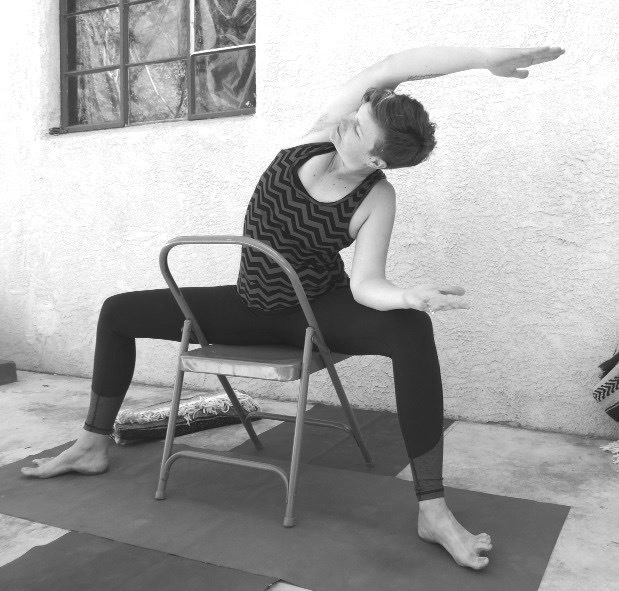 Utkata Konasana: Goddess/ AKA Horse pose on chair: Make sure the knees are open about 90 degrees. See that the joints of the legs line up, hip-knee-ankle-toes all pointing in the same direction; watch for feet that want to turn out more than the hips and knees. Once you get the feel of it on the chair, try it at the wall, with the sacrum and upper back and head resting on the wall and the heels and knees about a foot away from the wall: same work, but even more stabilizing. 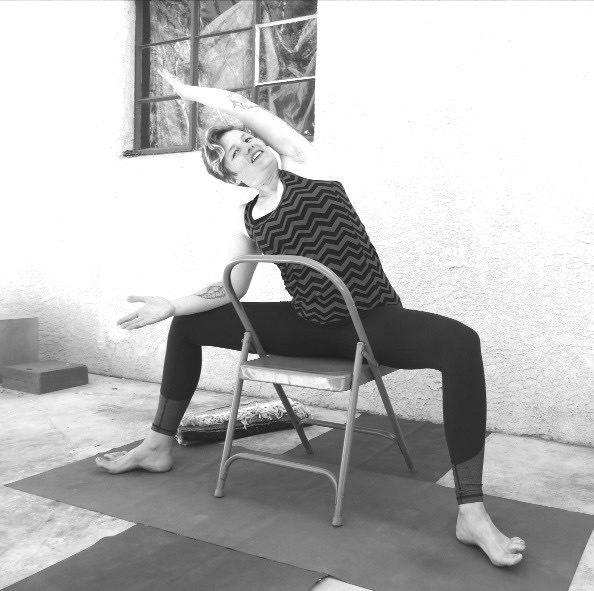 You can also do shoulder openers, or work the upper body as in parsvakonasana during the chair supported version. 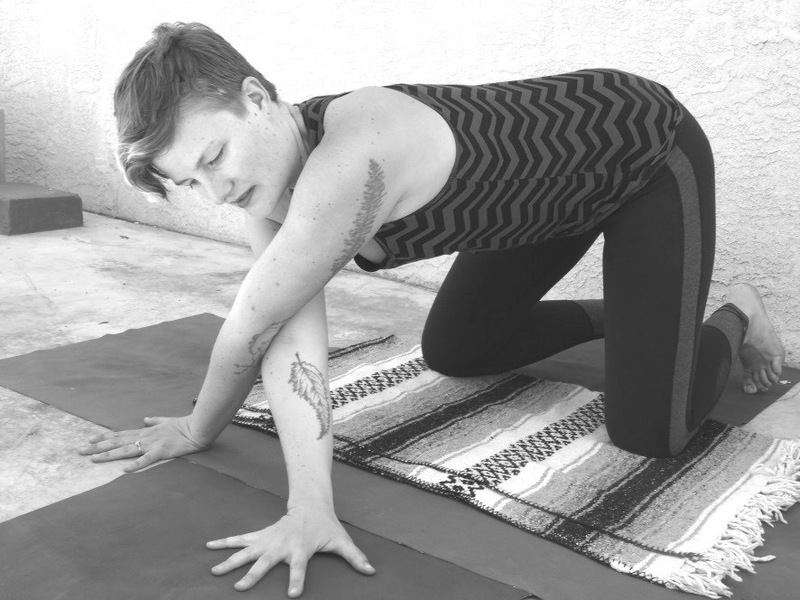 This pose is fabulous for sacral stability. As the sacrum draws forward, the SI joints are supported my the muscular work in the thighs to close. I experienced terrible sciatica (pain caused by compression to the sciatic nerve) and SI joint pain during pregnancy, due to the relaxin opening and destabilizing what was already loose to begin with. This pose helped immediately and immensely to resolve my pain. It also builds the strength required for active labor. 7. Prasarita Padotonasana: Expanded Legs Forward Bend: To practice this pose, the feet are parallel, heels separated about as wide as the wrists when the arms are extended out the side. The sitting bones lift and broaden, the pelvis rotates forward around the thigh bones, so the front spine can extend. Keep the heels heavy, reaching the tailbone back behind the heels, as you lengthen forward through the spine, crown of the head, and arms. Take enough height so that the front body is spacious. As you forward bend on the chair: push chair forward, draw tail back… HEELS HEAVY. 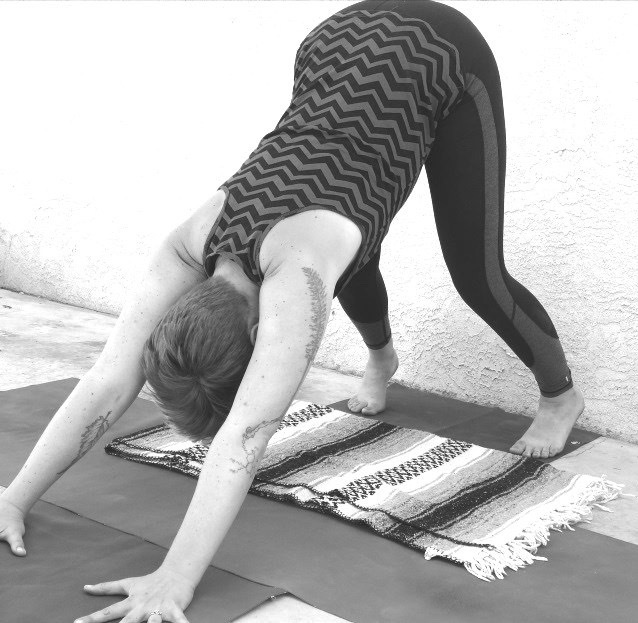 You can stretch the mat wider between the feet isolmetraically to broaden the inner pelvis and stretch the pelvic floor, or press the outer legs in medially, as though you would slide the legs towards each other, to help draw the sacrum in, and stabilize. If you are familiar with both actions, do both at once! A good way to use this pose for relieving low back pain, try practicing it on a kitchen counter throughout the day. This can be a great labor pose when leaning the upper body (chest, arms, and head) forward onto a high bed or soft padded counter. As a yoga pose it helps strengthen the legs and increases circulation to the reproductive organs, while also lengthening and releasing the lower back. This is a great pose to do before bedtime, or whenever you need a restful moment, as it helps increase circulation to the adrenal glands, which helps shift the nervous system away from the fight-flight stress mode, and into the replenishing parasympathetic mode. It is a wonderful release for the low back, and, with enough support, can be a great labor pose. For most moms, 2 bolsters stacked are a lot better than one! Make sure the head and chest are supported, while the belly is free to rest in the open space between the thighs. If sitting on the heels is not comfortable, fill in the space with folded blankets, and or have a block between the ankles as in virsana. Let the back body open and relieve the breath as you inhale, while the exhalations resolve the weight of the head down. 9. Savasana. A very important pose, don’t skip it! Use a 10 minute timer if you have trouble staying for more than a couple minutes. 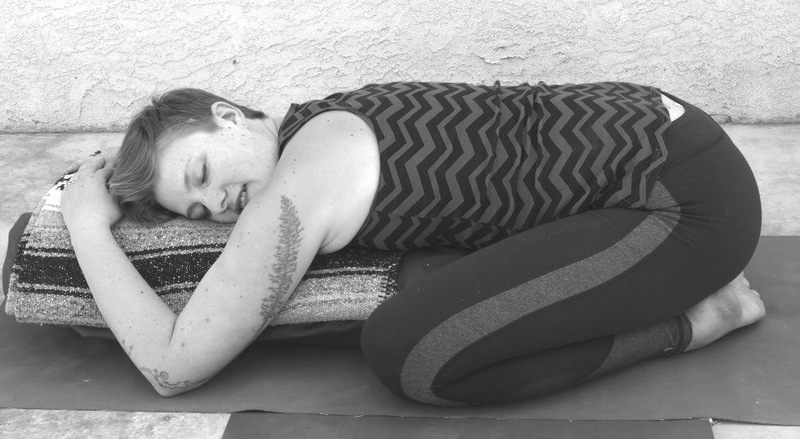 Savasana (corpse pose or final resting pose), is an important time to integrate the benefits of the more active poses. The nervous system can digest the goodness. This is a great time to do a guided relaxation, a chance to train the mind to be present with the feeling of letting go, consciously, rather than reacting blindly to, or resisting, sensation. The more the nervous system experiences relaxation, the stronger and more familiar the neuroreceptor connections are that create that experience. So practice establishes calm and relaxation, makes it more accessible for the future. Relaxation and feeling safe are key factors in the healthy release of hormones and endorphins in labor, and helps mom stay present, centered, and not overwhelmed by the intensity of contractions. As you rest, notice how easily the mind wanders, and how gently you can come back to the feeling of the exhalations and letting go… The mind may criticize “you,” or itself when wandering, but just come back to the feeling of softening, melting… feeling over time how all the layers of the body become more fluid, heavy, spreading out into the safe embrace of the earth. The bones rest very deep. Trust gravity to hold you. Especially the head becomes heavy. All the layers of the neck release, the inner jaw softening, the eyes resting inwards, as the all the layers of the brain melt down very heavy into that support. Every breath, letting go, letting go. You can close your session with a meditation, sitting in any comfy seated pose, breathing love down to the baby, which my teacher’s guru, Sri Goswami Kriyananda says plants seeds of happiness in the babies consciousness that blossom later throughout the babies life. Place the left hand on the heart, right hand on the belly. Inhaling, expand you heart with pure love; exhaling, send that loving energy down through the warmth of your right hand, to you rewet baby, who has come at just the right time, choose just the right mother, the right family for there unique journey. Bathe your baby in pure loving attention, compassion, affection, and appreciation. Perhaps sense that as you help your baby grow, this baby is helping you grow: deeper into your strength, your wisdom, your power and beauty… you capacity for joy. You can then let this love surround your whole self, too…in a cloak of protection and peace. 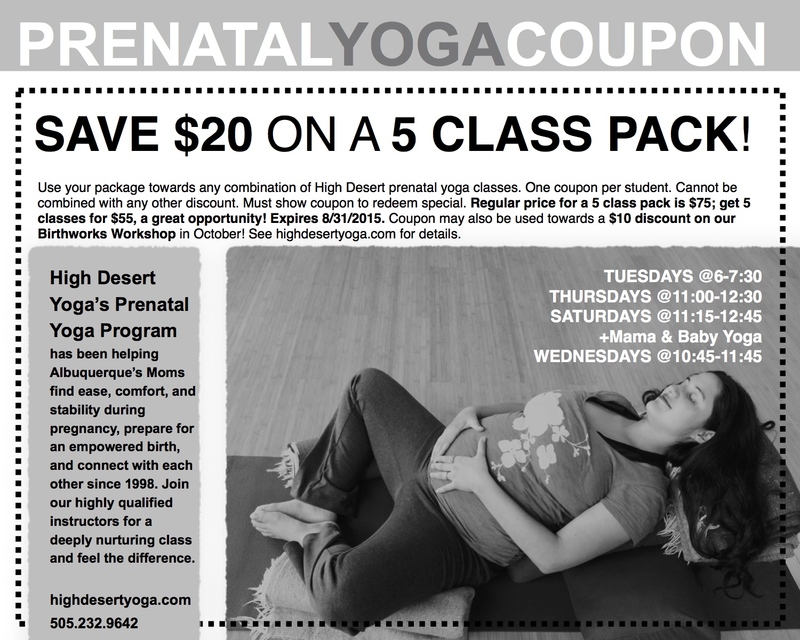 For Albuquerque Pregnant Moms, here is a great coupon for Prenatal Yoga at High Desert Yoga; my class is on Thursdays, perhaps I’ll see you there!